It was November 10th, around 3:00 pm, when I first saw movement behind my tree stand. A big doe and a fawn were feeding as they quickly passed behind me. They were real spooky because it was such a windy afternoon. When they were out of sight I settled back down again. As time went by the wind started to pick up and I was just about to call it quits when I thought I heard something behind me. Slowly, I turned to take a look. I couldn't believe what I saw. Less than fifteen yards behind me stood the buck I had been after for three years. I never even heard him come in. He then started walking right at my tree, stopping about 15 feet straight down underneath me. I could actually hear him breathing. I thought he would spook for sure. I couldn't take it any longer so I shot straight down at him. He just stood there looking at the tree. I couldn't move a muscle. Then he turned around and started smelling the ground, giving me the opportunity to nock another arrow. As he started quartering away, at about 18 yards, I shot again. He took off crashing through the woods. I watched him as far as I could, he didn't act as if I'd hit him at all. Everything happened so fast that I didn't have time to get excited. But when the deer was out of sight, I started shaking so badly I could hardly climb down out of the tree. When I got to the ground, I searched for my arrow. It was 4 feet away from the tree, sticking straight out of the ground. The arrow never touched him. Quickly I looked for the other arrow, but couldn't find it. By this time it was dark, so I left the woods to return in the morning at first light. It was a hard decision to leave, but I didn't want to mess-up any sign that the deer might have left or spook the deer any further. I couldn't sleep at all that night. Upon returning to my hunting spot in the morning, I looked for the second arrow. I found it covered with blood, it had gone clean through. After about a 250 yard tracking job with my friend Paul and his friend, there lay the buck I had hunted for three years. I just couldn't believe it. 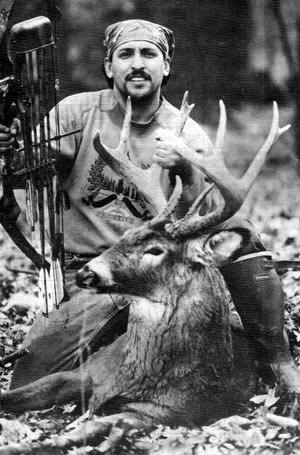 The buck aged at 7 1/2 years old and scored 138 Pope & Young. It had a dressed weight of 218 lbs. The head mount was done by Skip Reilly of Guilderland, NY. What a great job he did, thanks Skip! Of eighteen bucks I've harvested in the past, this one was the biggest. I thank God for allowing me to harvest such a beautiful animal. Happy hunting and good luck out there in the woods.